Easter flowers are a symbol of Spring and GROWER DIRECT - THUNDER BAY in THUNDER BAY, ON has a large array of beautiful Easter arrangements to choose from. Remember your loved ones this season with a bouquet of Easter lilies, assorted tulips, or crocuses. For a more customized gift, let GROWER DIRECT - THUNDER BAY put together an Easter basket that even the Easter bunny would be jealous of. Browse and order online or stop by our store to place an order this season. Let GROWER DIRECT - THUNDER BAY in THUNDER BAY, ON take care of you and your loved ones this Easter. Administrative Professionals Day (Secretary's Day) is a day dedicated to showing appreciation for the executive assistants and administrative professionals who work so hard for you. GROWER DIRECT - THUNDER BAY in THUNDER BAY, ON has great gift ideas that are certain to show just how much you really care. GROWER DIRECT - THUNDER BAY offers customized assorted floral arrangements and gift baskets to fit your needs. Roses, daisies, or plants are a great way to say "Thanks" this Administrative Professionals Day (Secretary's Day), while a gift basket filled with your administrative professional's favorite things is a thoughtful, personal way to show your appreciation as well. Browse and order online or stop by our store to place an order with GROWER DIRECT - THUNDER BAY in THUNDER BAY, ON this Administrative Professionals Day (Secretary's Day). Mother's Day is a special holiday for any family and GROWER DIRECT - THUNDER BAY in THUNDER BAY, ON has unique gift ideas that are sure to make any mom smile. Send Mom a bouquet of her favorite flowers. Top it off with a balloon bouquet that expresses just how much you love and appreciate her this Mother's Day. Browse and order Mothers Day flowers online or stop by our store to place an order with GROWER DIRECT - THUNDER BAY in THUNDER BAY, ON for all your Mother's Day floral and gift needs. Wish Grandma and Grandpa a Happy Grandparents Day with a special flower arrangement from GROWER DIRECT - THUNDER BAY in THUNDER BAY, ON. Our floral designers can create a lovely Grandparents Day flower arrangement, a lush dish garden of green and blooming plants, or custom gift basket for your grandparents or any special seniors you know and love. Studies have shown that fresh flowers can give Senior Citizens a "pick-me-up" that lasts for days... Let your Grandparents know just how special they are by contacting your local THUNDER BAY, ON flower shop - GROWER DIRECT - THUNDER BAY to arrange the perfect Grandparents Day flowers and gifts. Sometimes the best way to show your boss just how much you appreciate their fine leadership is by sending flowers. 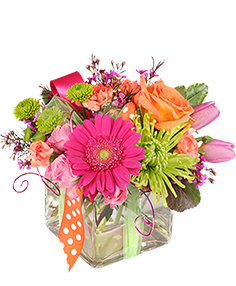 With a National Boss Day gift of flowers from GROWER DIRECT - THUNDER BAY your boss will know exactly how you feel. Everyone wants a raise. Raise your boss's spirits this Boss Day with one of the many colorful flower arrangements from GROWER DIRECT - THUNDER BAY in THUNDER BAY, ON. Sweetest Day is like a mix between Valentines Day and Thanksgiving. It’s a day to give thanks for those extra-sweet people in your life. The holiday originated with a candy store owner who wanted to bring cheer and some happiness to the lives of those who were often forgotten. A great way to celebrate Sweetest Day is by ordering a gift basket of sweet treats from GROWER DIRECT - THUNDER BAY for your someone sweet. Have you started your Christmas shopping yet? Do you have someone on your list who is proving difficult to buy for? Why not send them a year worth of flowers?! Starting from just $45.00 per month we will deliver a beautiful arrangement once a month for 12 months! Call the shop for further details: 475-ROSE (7673) or 1-866-526-7673. A Christmas gift of flowers from GROWER DIRECT - THUNDER BAY in THUNDER BAY, ON is sure to make any Christmas or Holiday celebration 'merry and bright'! Along with our premium fresh flower choices, we offer decorative Christmas trees, Christmas gift items, and Christmas cards. Shop early for our best selection of beautiful holiday poinsettia plants with unique colors and sizes available. Choose an eye-catching Christmas centerpiece, contemporary winter vase design, or a charming holiday basket of fragrant Christmas flowers and evergreens. Call GROWER DIRECT - THUNDER BAY in THUNDER BAY, ON (ON) directly or send Christmas gifts of flowers online, along with your warmest holiday wishes for Christmas, December 25th. Love is in the air at in THUNDER BAY, ON. Needing something for that special person you married or are dating? Let GROWER DIRECT - THUNDER BAY help you this Valentine's Day with some of our truly unique gift ideas. We have everything you need to make your Valentine smile - from beautiful floral arrangements to customized Valentine's gift baskets. Let GROWER DIRECT - THUNDER BAY in THUNDER BAY help you with all your Valentine's Day gifts. Browse our sample Valentine's Day selections and order online, stop by our store, or give us a call in order to customize your special someone's Valentine. There's no better way to say 'I love you' on this holiday than with flowers from in THUNDER BAY, ON.